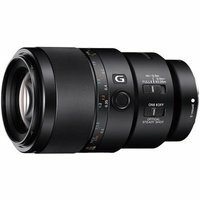 The Sony FE 90mm f2.8 Macro G OSS lens is the first full frame E-mount medium telephoto macro with built-in image stabilisation to deliver crisp, high-resolution images with beautiful bokeh. A floating focus mechanism ensures that consistently superior optical performance is achieved at all focusing distances. The lens features a 1:1 magnification ratio and 0.28m minimum focusing distance.